When your car goes in for it's MOT, you want it to disrupt your day as little as possible. Maybe you take the garage up on it's offer of a curtesy or hire car, or perhaps you will have organised alternative transport. Either way all you want to do is drop the car off, and then once it has finished pick it up with it's new certificate or be told what needs to be fixed and what the cost will be to get it to pass the MOT. An HR MOT is similar. We will carry out the work, causing the minimum of disruption to your business. Your team do not even need to know it is being carried out. (not each individual, just each type). Collate all your present policies and procedures and pass them on to us. Answer a few short questions about how your business operates, the type of people you need to employ, what types of jobs they carry out, hours of business etc. 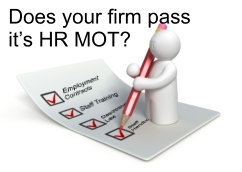 Give us an hour of your time once the HR MOT has been carried out to talk through the report. Decide whether you would like to update your policies and procedures and implement them yourself and would prefer to pay us to do it for you.